THIS IS A PAIR of most unusual 3-D works. Rather than using standard black and white or color film, Steve Schwartzman has created all his 3-D imagery with infrared film, which captures the aura surrounding all of us (and invisible to our eyes) as a soft luminescence. Steve has printed all of these photos as high-quality black and white duotones. Most of these photos have been taken around the area of Austin, Texas, where Steve has lived for many years. Stereo Infrared Landscapes contains 14 stereo pairs, while Bodies of Light has 44 pairs. 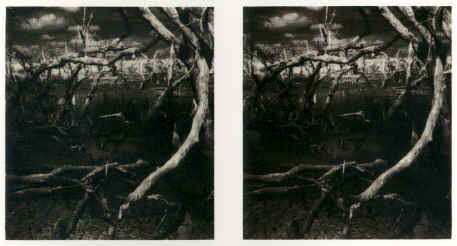 Perhaps the best way to describe Steve's photographic technique is to say that it has an ethereal quality that floats up and out of each image into the eyes and mind of the viewer. From landscapes to nudes, Steve's work artfully and tastefully captures each subject's dimensional essence and quality. A lorgnette viewer is needed for viewing. 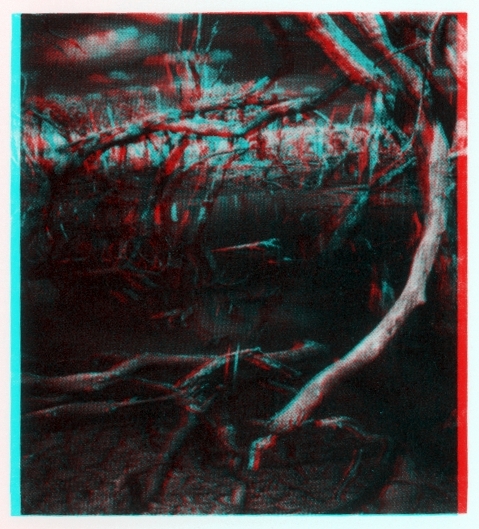 Below is a stereo pair and an anaglyph from Infrared Stereo Landscapes. Please click for a larger image.